The Red Cedar Zen Community invites you to join us in the practice of Zen meditation. By settling the heart and mind in this very moment, we can bring a little more peace and openness to our lives and our world. Our Soto way emphasizes the daily practice of sitting meditation (zazen) and the integration of formal practice and daily life within the context of a community of practice. We follow the traditional forms of the Soto school of Zen with a spirit of warmth and inclusion. Everyone interested in meditation, whether brand new, experienced in other traditions, or schooled in formal Zen, is welcome to join our practice. Please see our Getting Started page. Our weekly meetings are every Wednesdays nights at 7pm, Friday at noon, and Saturday mornings at the Red Cedar Dharma Hall (see practice). Retreats of one to eight days are held annually (see the Events list and Annual Calendar). Meditation instruction and orientations for new sitters are offered at 6:30pm on Wednesdays and by request. You are welcome to practice with us whether you've attended an orientation or not. Feel free to "just show up." The Dharma Hall is located at 1021 N. Forest Street on the edge of downtown Bellingham, just south of Forest and Maple (two doors down from The Majestic). (see directions). Our email list offers occasional updates and the Responding Gate newsletter - Sign Up Here. Or consider joining Red Cedar Zen as a Member. 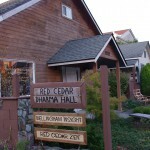 Red Cedar Zen Community and the Red Cedar Dharma Hall has a new general phone line: 360-389-3444. Thank you.